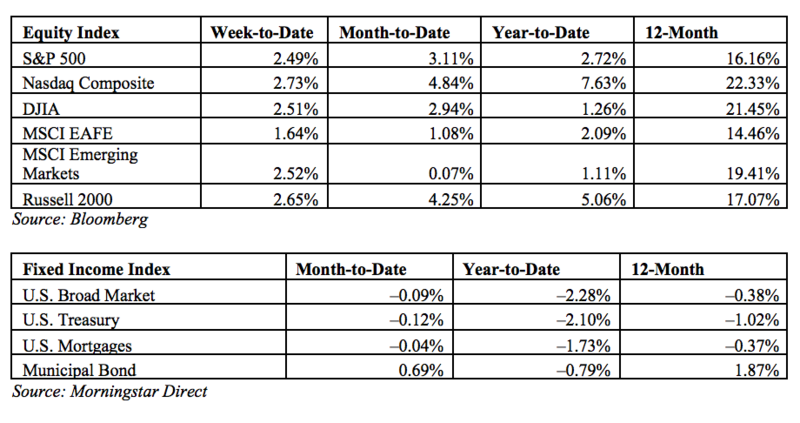 The 10-year Treasury yield remained range-bound between 2.95 percent and 3 percent last week. Meanwhile, the 30-year opened Monday at 3.11 percent, and the 2-year stood at 2.53 percent. As the yield curve continues to flatten, the risk of an inverted yield curve—where short-term rates are higher than long-term rates—is rising. Historically, an inverted yield curve has been a good indicator of impending recession. The U.S. markets experienced a risk-on rally last week, with energy, technology, financials, and industrials all up more than 3 percent. Strength in oil helped bolster the performance of some of the more cyclical sectors. West Texas Intermediate and Brent crude gained 1.5 percent and 3 percent, respectively. With investors more interested in risk assets, bond proxies in the utilities, consumer staples, and REIT sectors struggled. Markets also were buoyed by inflation news (more below), as well as by more positive sentiment surrounding U.S.-China trade talks. The White House confirmed last week that China’s top economic official, Vice Premier Liu He, would be traveling to Washington for additional trade discussion. Turning to economic updates, last week was relatively quiet outside of inflation data. On Wednesday, the Producer Price Index moderated somewhat, coming in at 2.6-percent growth on an annual basis. This result may help offset some fears about rising prices. On Thursday, the Consumer Price Index came in at 2.5-percent year-over-year growth. This result was in line with expectations. Inflation figures will be watched closely for the rest of the year as the Fed continues to hike rates. Finally, on Friday, the University of Michigan consumer sentiment survey beat expectations by staying unchanged at 98.8. This high level of consumer confidence is encouraging and should spur spending growth in the second quarter. This week, we’ll be looking at the economic data to see whether earlier signs of a slowdown are passing. Tuesday’s retail sales report may moderate somewhat at the headline level. Growth is expected to tick down from an extremely strong 0.6 percent in March to a still healthy 0.4 percent in April. There may be some downside risk here, as auto sales declined last month. A rise in gas prices should offset that, however, so any damage is likely to be limited. Core retail sales, which exclude autos, are expected to accelerate from 0.2-percent growth in March to 0.5-percent growth in April. Here, the rise in gas prices could improve this result. If growth remains strong, it will suggest that last month’s positive results are sustainable and that consumption growth is likely to exceed weak first-quarter levels going forward. Housing is the next area where a rebound is expected. The National Association of Home Builders survey, released on Tuesday, is expected to rebound from 69 in April to 70 in May. Meanwhile, the housing starts report is expected to remain steady at 1.32 million in April, the same as in March. A drop in building permits and elevated lumber prices could weigh on this result. Finally, on Wednesday, we’ll see the industrial production report. It is expected to show an acceleration in the headline index from 0.5-percent growth in March to 0.6-percent growth in April, driven by gains in manufacturing output. In fact, manufacturing is expected to bounce back, rising from 0.1-percent growth in March to 0.8-percent growth in April, due to strong growth in hours worked. This would also be a rebound from a weak first quarter and suggest faster growth ahead.